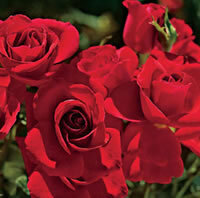 Red roses are a timeless plant that brings elegance and grace to all your landscaping ideas. There are few people who do not appreciate the simply beauty of a red rose, and even fewer still who have not given roses as a gift to a loved one, or have been the recipient of such a gift. There are a number of varieties of red roses and this is something that many people don’t give a lot of thought to. Here we will go over a few of the varieties that you could choose to grow in your own garden. If climbing roses are your thing then you should check out red rose pictures of the Blaze of Glory climbing rose. This vigorous climber can engulf a 6 foot tall trellis in a single season and reaching a full mature height of 12 to 14 feet tall. 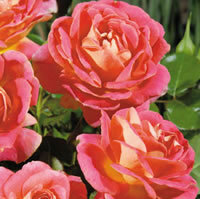 Hardy in zones 5 through 9, the Blaze of Glory climbing rose will give you plenty of fiery blooms all season long. The blooms will reach about 4 inches across and have 20-25 petals that give off a pleasant light musk fragrance. The Simplicity red rose is a great rose for any of your landscaping ideas! This variety produces stunning double blooms in a great dark red starting in spring and continuing through until the fall. Simplicity is a great choice if you are looking for a hedge rose to put in a border garden, or even just as a standalone somewhere on your property. This variety will only grow about 3 feet to 3 and a half feet tall, making it ideal for most landscaping. You can expect blooms about 3.5 inches across with this variety. 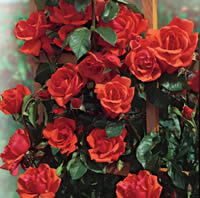 If shrub roses are more your style you should really take a look at red rose pictures of the Red Sky Delight shrub rose. This amazing garden beauty does its best work in a full sun location and is capable of growing 5 to 6 feet tall and about 4 feet wide. Red Sky Delight will offer your garden or landscaping with endless color starting in late spring and continuing on through the summer. You will be blessed with countless 2 inch to 2.5 inch blooms in shades of dark orange, red, and white. Frankly Scarlet is a spicy scented red rose that has been bred to re-flower more rapidly than other floribundas. Another unique aspect of this particular rose is the large 4 inch blooms will hold their rich satiny red color from beginning to end. Frankly Scarlet has a very compact form also, only growing to about 3 feet or so tall at full maturity, which makes this an ideal selection if you are looking for a rose to grow in a container. The Lovestruck floribunda is proclaimed as one of the most showiest floribundas of its kind and is widely seen in red rose pictures. The plentiful 4 inch blooms come out at the end of long stems and offer an almost brushed look of deep pink and light reds that have a cream colored reverse. This variety is hardy in zones 5 through 9 and offers an excellent resistance to diseases compared to other floribundas. The Lovestruck rose is a fairly compact plant, only growing about 3 feet tall which makes it well suited to a variety of landscaping ideas around your home. The Shazam floribunda is an incredible variety that is sure to liven up any garden or landscaping with its electric colors. 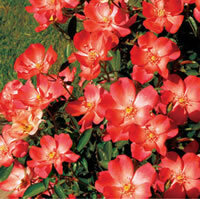 You will not be disappointed with the abundant hot pink and light red blooms that offer a light yellow reverse. 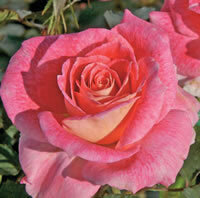 The Shazam rose offers amazing bloom power and provide you with plenty of 4 inch blooms each growing season. This variety grows about 4 feet to 6 feet tall and about 3 to 4 feet wide at full maturity. Shazam is a little more hardy than other types of roses, wintering well in zones 4 through 10. If cut roses are what you are looking for then you need to see red rose pictures of the Tuscan Sun rose. 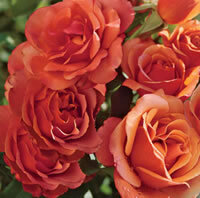 This gorgeous rose offers long stems that produce spicy scented blooms in a unique orange-red or copper color. The Tuscan Sun rose is a champion rose that has an exceptional resistance to diseases and looks absolutely amazing in bouquets. The blooms reach around 4 inches in diameter with a petal count of around 25. This is also a fairly hardy rose, well suited to zones 4 through 10. You can expect the Tuscan Sun to grow about 3 to 4 feet tall and almost equally as wide. These are just a few of the kinds of red rose pictures that you are likely to find on the internet these days. Truth be told there are countless varieties of red roses that you could spend a lifetime researching them and cataloging them. Red roses are hands down some of the most popular roses you will find anywhere and many gardeners gravitate to them above all others. Some grow red roses for their elegance and grandeur, others grow them for their many fragrances that range from strong damask scents like the Don Juan climbing rose, to the more sweet smelling roses like Veterans Honor that has a distinct fragrance of something akin to raspberries. 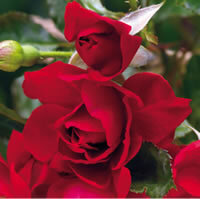 You can find red roses in all classes of roses, from climbers to miniatures, floribundas to hybrid tea roses. You can find red roses that are hardy and durable, while others will be somewhat frail and require a lot of maintenance to keep them blooming and healthy. Whatever your reason for choosing red roses, you are unlikely to be disappointed when your garden fills up with blooms every spring.